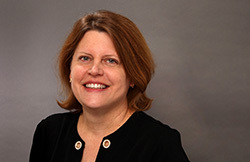 LAWRENCE — Sally Buzbee, executive editor of The Associated Press news agency, has been selected to receive the 2019 William Allen White Foundation National Citation. The award, which recognizes individuals for outstanding journalistic service, comes from a vote of the trustees of the William Allen White Foundation, which is named in honor of White. Buzbee, a 1988 graduate of the University of Kansas William Allen White School of Journalism & Mass Communications, will accept the award on William Allen White Day, which is April 11. Buzbee’s speech, set for 3 p.m. in the Woodruff Auditorium in the Kansas Union, is free and open to the public. As executive editor and senior vice president of the AP, Buzbee oversees the news service’s global operation, which includes journalists in more than 254 locations in 100 countries. Buzbee, who graduated from high school in Olathe, joined the AP in 1988 as a reporter in Topeka, then worked as a correspondent in San Diego. In 1995, she moved to the Washington bureau and reported on education and politics. She eventually became assistant chief of bureau, overseeing foreign affairs and national security coverage. In 2004, she became AP's Middle East editor, directing coverage across 16 countries including coverage of the Iraq War, Iran’s nuclear ambitions, wars in Gaza and Lebanon, the Darfur crisis and tensions in the Gulf. In early 2010, she was promoted to deputy managing editor in charge of expanding AP's Nerve Center in New York, created to collaborate on comprehensive coverage with regional and department leaders around the world. Later that year, she was named Washington bureau chief, where she oversaw coverage of the 2012 and 2016 presidential elections, the White House, Congress, the Pentagon, polling and the bureau's investigative team, which in 2012 won a Pulitzer Prize for investigative reporting on the New York police department’s surveillance of Muslims. In addition to her journalism degree from KU, she has a Master of Business Administration degree from Georgetown University. She has two daughters. Her husband, John, who died in 2016, was also a graduate of the KU journalism school. Other notable recipients of the William Allen White Foundation National Citation include Cokie Roberts, Leonard Pitts Jr., Paul Steiger, Gerald Seib, Candy Crowley, Seymour Hersh, John Carroll, Walter Cronkite, Arthur Sulzberger Jr., Helen Thomas, Charles Kuralt, Bernard Shaw, Bob Woodward, Molly Ivins, Gordon Parks, Bob Dotson and Frank Deford. A complete list of recipients is at www.journalism.ku.edu. The William Allen White Foundation was founded in 1945, one year after the Kansas Board of Regents established the William Allen White School of Journalism & Mass Communications at KU. The William Allen White Foundation has been recognizing outstanding journalists since 1950, but the first National Citation medallions were awarded in 1970.